If you love natural products, you’ll love Aveda, the brand known for using flower and plant essences in its formulations. 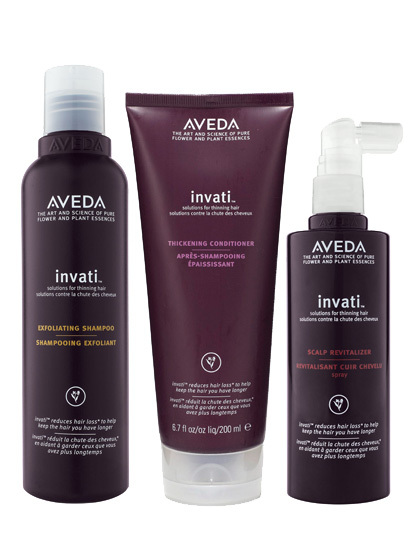 I recently tried their Invati range – a collection of hair products secifically formulated for thinning hair. Launched in January, it fuses ancient Ayurvedic wisdom and technology innovations. It’s 97% naturally-derived and it helps to thicken the look of hair and reduce hair loss due to breakage by 33%. The complex of Ayurvedic herbs, including Turmeric and Ginseng is called Densiplex™ and it’s very invigorating and revitalising. Their exfoliating shampoo (if you’re wondering it’s not textured ike a scrub!) smells fantastic and leaves your hair feeling clean and soft, it also removes build-up that can clog pores, allowing your body to work more effectively. The thickening conditioner, of a similar scent, is so creamy it feels almost like a mask or a deep treatment making every-day hair-washing feel luxurious. It improves elasticity and minimises breakage. From September to November, Aveda introduces its Invati Hero Campaign – Aveda salons and stores will invite guests to discover the power of Invati. You can follow Aveda on twitter on @AvedaUK for top tips on optimum haircare and ask them any questions relating to your hair concerns. This entry was posted in Haircare and tagged Aveda, Ayurvedic, Densiplex, hair loss, heir thinning, invati. Bookmark the permalink.